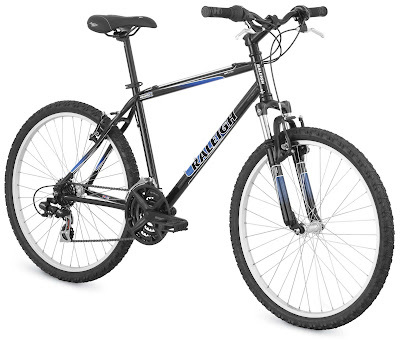 Century Cycles Blog: Win this bike at EarthFest from Century Cycles and The WAVE! Win this bike at EarthFest from Century Cycles and The WAVE! This morning at 10am, EarthFest 2009 opens at the Cleveland Metroparks Zoo. It's Ohio's largest environmental education event and one of the longest-standing continuous Earth Day celebrations in the country. Look for the The WAVE radio station booth in the Welcome Plaza, where Century Cycles is teaming up with The WAVE to give away a Raleigh Mojave 2.0. The bike comes decked out with Avenir rack and panniers, water bottle and water bottle cage, and a "Define your life. Ride a bike." t-shirt -- all ready to ride all around town! And riding around town to errands and visits can make a big difference -- a short, four-mile round trip by bicycle keeps about 15 pounds of pollutants out the air. So stop by The WAVE's booth and enter to win either the bike or tickets to see the Moody Blues, plus guitarist Brian Henke will make a special appearance! Only one person will get the bike, but everyone can also pick up Century Cycles coupons in The WAVE's booth, good for 15% off bicycle accessories (like those cool racks and panniers for commuting), $20 off ANY bicycle, and a FREE safety check (in case you want one of our expert mechanics to inspect the bike you already own).